1. THEY LIVED FOR THE GLORY OF GOD. Comment: The saints understood in an intense and radical manner that God is the Supreme Good of our lives, and so they patterned their lives to do all that they could for the Glory of God. In short, the saints realized that God is our true end and that nothing compares to the inestimable treasure we have in God. 3. THE SAINTS PRACTICED GREAT DEVOTION TO MARY Comment: Study the lives of the saints. They loved Mary. They were devoted to her. Their love of God grew as they placed their confidence in Mary. The saints realized that Mary is a special gift of Jesus for his disciples. 4. THE SAINTS WERE DEVOTED TO PRAYER Comment: The saints realized that it is impossible to persevere and grow in holiness without prayer. They realized that prayer is the fuel that feeds the interior life: the life of personal relationship with God. They knew that to neglect prayer was akin to denying air to the body. 5. THE SAINTS WERE DEVOTED TO THE EUCHARIST Comment: The saints drew extraordinary strength from the Eucharist. To receive Jesus in Holy Communion was the great joy of their lives. They also had a great attraction to Eucharistic adoration. 6. THE SAINTS WERE DEVOTED TO THE POOR Comment: In imitation of Christ, the saints were filled with a special love for the poor. The more they loved God, the more they were attracted to help the poor. 7. THE SAINTS LOVED THE CHURCH Comment: The saints loved the Church, knowing as they did that the Church is the bride of Christ. They were steadfastly loyal to the doctrines and dogmas of the church, and even when unjustly wronged by church authorities they bore their burdens with peace of soul and waited on God to remedy such difficulties. “The honor of God …is deeply implicated in the worship paid to the saint. In some sense [God] is more jealous of it than of His own; less patient of levity with [His saints] than with Himself, and frequently punishes persons for this [levity]. The saints themselves have entered into the dispositions of God, and, with a sort of vindictive holiness, hard for us in our present state to understand, resent familiarities and impertinences…. Faith is the chief ingredient in a true devotion to the saints; faith is the reality of their power, and of their relationship towards us. It is a great sign of a man being supernatural when he fears to offend a saint. The favors of the saints form a great department of the Divine Mercies, and play an important part in the sanctification of holy men…. Weakness of prayer is one of the feeblenesses of our times, through want of faith and fear; this is one way to set them right. We always fear those in whom we have confidence. We cannot ever put confidence in those whom we do not in some way fear.” From: Notes on Doctrinal and Spiritual Subjects, Volume I, pages 381-82. I believe Father Faber is saying that we should hold the saints in great awe and reverence, and have great faith in the immense power of their intercession, because they have been so completely transformed into the life of God. Faber reminds us that such “great holiness is a thing to fear.” And this reverential fear of the saints will no doubt lead to a more sincere love of them and great confidence in their power to help us on our journey to Heaven. 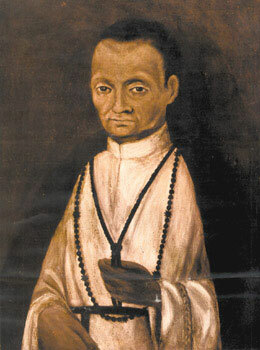 Image: According to Wikipedia: “Portrait of St. Martin de Porres, c. 17th century, Monastery of Rosa of Santa Maria in Lima. This portrait was painted during his lifetime or very soon after his death, hence it is probably the most true to his appearance.” Public Domain, U.S.A. My mother used to mention Saint Martin de Porres and Saint Rose of Lima, and these two saints are among my favorites. Saint Martin de Porres’ life was marked by amazing mystical phenomena.